Completely waterproof down to 30 feet underwater indefinitely, the Waterproofed Fitbit Charge 2 has been enhanced on the inside with our durable PlatinumX waterproofing process. Swim, surf and by all means sweat without any worries that your Waterproof Fitbit Charge 2 can keep up. Learn more about Our PlatinumX Waterproofing Process. A bigger, brighter screen displays your fitness stats with new clarity. Choose how you want to see those stats with your choice of a selection of new watch faces. Interchangeable wristbands allow you to easily customize the Charge 2 for any occasion and mood. Winsome animations guide you and reward you for hitting goals. Know exactly where you've been with the new connected GPS, use the guided breathing sessions to gain focus on the now, and get encouraged in the future with the Charge 2's hourly reminders to get up and move. 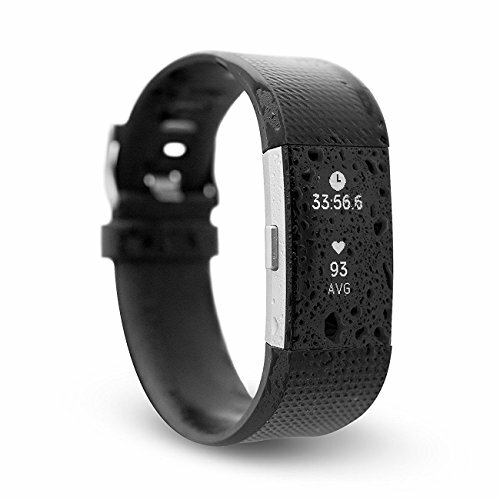 The Charge 2 will now also calculate a number of factors and measurements to produce your Cardio Fitness Score. Making it easier to know where you are on your fitness journey. Personalize your goals, record workouts, and see detailed stats about your daily habits and progress on the Fitbit Dashboard. Log meals, compare workouts, route runs, and connect with Fitbit wearing friends. Syncs with Fitbit App for mobile or Fitbit Connect for Macs and PCs. The Fitbit app is available on over 200 different devices and is comparable to the Fitbit dashboard. Track your workouts, monitor your performance, set goals, and share your progress all within one app. TAP INTO FITNESS with the new larger tap enabled screen. The bright OLED displays the time, heart rate, stats, notifications, and guided breathing sessions. If you have any questions about this product by Waterfi, contact us by completing and submitting the form below. If you are looking for a specif part number, please include it with your message.